Meerkats seem to be all the rage right now and this slot by Push Gaming sees a family of meerkats make a push into online slots. This family comprises of a mother and father meerkat, their grown up daughter and their young toddler son, who is wild in more ways than one! The game has some interesting features, including a hold and re-spin when a meerkat fills the first reel and a free spins bonus feature, while the oversized meercat symbols can make for spins with a huge amount of wins. This slot is an exclusive to the huge Unibet Casino, you can find it via the ‘casino’ then ‘exclusives’ listing or simply use search. Check out all the latest slots and claim your 50 free spins on Mega Fortune Dreams over at www.unibet.com now! This slot, like many other online games, has 5 reels. However, the four symbols on show on each of the reels makes for a larger than normal size slot. The game has 40 win lines and this number is set, so you’ll simply choose the total stake for each spin. The minimum amount is just 40p, rising all the way up to £100. Each of the four meerkat symbols are stacked four high, promising some large wins when these symbols manage to align. The father meercat is the highest paying symbol of all, worth 300 coins for the maximum five in a row, while the mum and the daughter are worth 250 and 200 coins respectively. They are joined on the reels by a telephone and a TV, which both pay 125 coins, while the standard symbols are completed by the playing cards 10, J, Q, K and A. The male toddler meerkat is the wild symbol and will substitute for any other symbol on the reels apart from the bonus one. The game has a handy autoplay option, where you can set the number of spins to 5, 10, 20, 50 or 100. You can also add a loss limit to the auto play, as well as set a single win limit too. You’ll also find comprehensive sound settings where you can choose to turn off all sound, just the music or just the sound effects. The first feature is activated whenever one of the four meerkats fills the first reel entirely. This will now be held in place and you’ll gain a free re-spin. Any matching symbols or wilds which land to the meerkat on reel one will see these held in position too, with the free re-spins continuing until no more land, at which point the reels will be evaluated and your win amount will be revealed. This feature can lead to some very big wins, where the same meerkat can fill much of the reels. The final symbol of the slot is the front door of the meerkat house, which appears on reels 1, 3 and 5. If this symbol lands on all three of these reels on the same spin you’ll enter the free spins feature. You’ll have a total of 5 free spins in this feature round. At the start of the round, the three non-wild meerkats will appear inside the meerkat house and one will be randomly chosen, meaning that this symbol will appear more frequently on the reels. You’ll also be assigned a random multiplier for the free spins too, making for a nice round, despite the relatively low number of spins. This Push Gaming designed slot has a particularly endearing feel. The four meerkat characters are designed in a cartoon style, each acting more human than meerkat. With each of these being oversized, you certainly can’t miss them and you’ll like them even more when they start giving you those big wins! The game is set against the backdrop of a meerkat community, little stone houses with doors and windows, while reeds and trees form the outline to the reels. The TV and telephone symbols might remind you a little of those seen in the Flintstones TV series, each looking somewhat outdated, while the playing cards are all seated on wooden planks. The accompanying sound to the game is an easy listening percussion tune, which is added to by appropriate beeps and exclamations when a win comes your way, or when the bonus symbols appear. Meet the Meerkats is a really entertaining game from the start. The re-spin when you land a meerkat completely on the first reel gives the base game a huge added boost, meaning that a big win is always just around the corner. Add to this the free spins feature and you’ve got a game that will hold your interest in the long term. 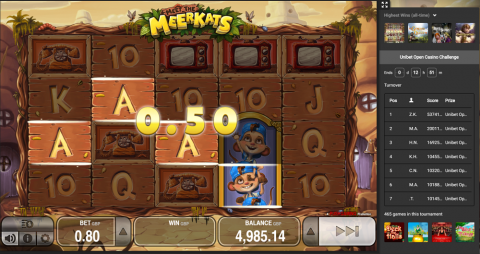 Fun and friendly too, this meerkat based slot is certainly recommended. Check out this exclusive slot at www.unibet.com – you can also claim a 100% welcome bonus + 50 free spins on the amazing Mega Fortune Dreams.